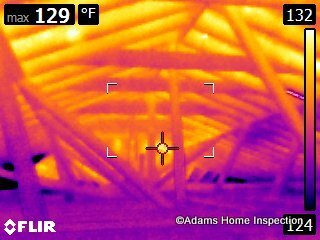 The usefulness of infrared thermography to identify building defects can vary with time of day, humidity and temperature so the best conditions for thermal imaging may be early in the morning or late in the evening when the building interior and exterior temperatures are changing most. 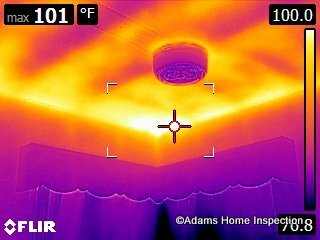 If conditions for thermal imaging are not ideal, I may need to return at a time when they are ideal or manipulate the building temperature by changing the HVAC thermostat settings or bringing in a portable heating device. 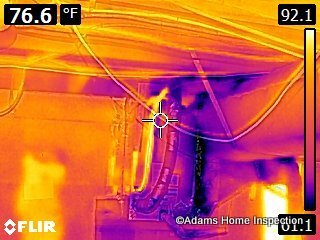 If you chose an inspector that utilizes thermal imaging in their inspection, ask what the image resolution is of the camera they will use. If they are using a camera with anything less than 100 x 100 image resolution, the camera is practically useless as an inspection tool. 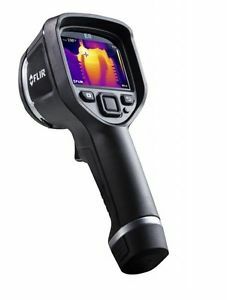 I use the Flir E6 camera with 160 x 120 image resolution. This exceeds the image resolution of 120 x 120 required by RESNET standards for energy audits. 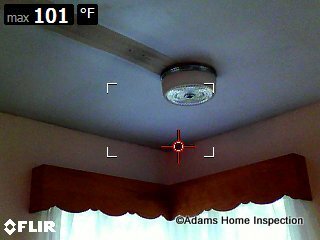 I have completed an infrared training certification course specifically designed for home inspectors. The photos below are examples of the types of images that can be produced using the Flir E6 camera with MSX overlay technology. MSX technology enables the camera to simultaneously take both a regular photo and thermogram and then display them in an overlay. This is extremely useful in being able to show the thermogram with a frame of reference. 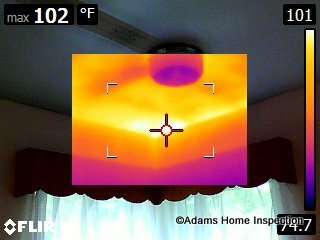 The photos below were taken with the Flir MSX capture feature. 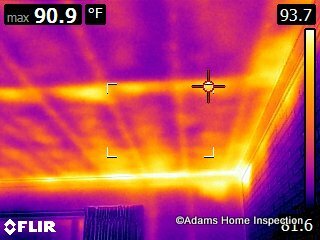 Thermal imaging when done properly can double the amount of time it takes to perform a standard home inspection. 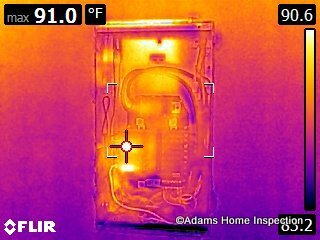 If you are interested in having both a standard inspection done plus more comprehensive thermal imaging done, please ask me about. 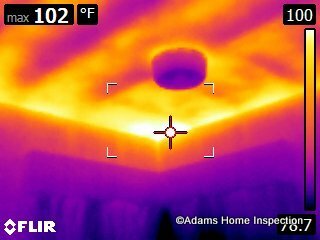 I have the capability to download the thermal imags to a laptop computer on site so that we can go over them together. If you don’t have time to view them on site, you can still view the images and read the accompanying analysis in my standard inspection report.